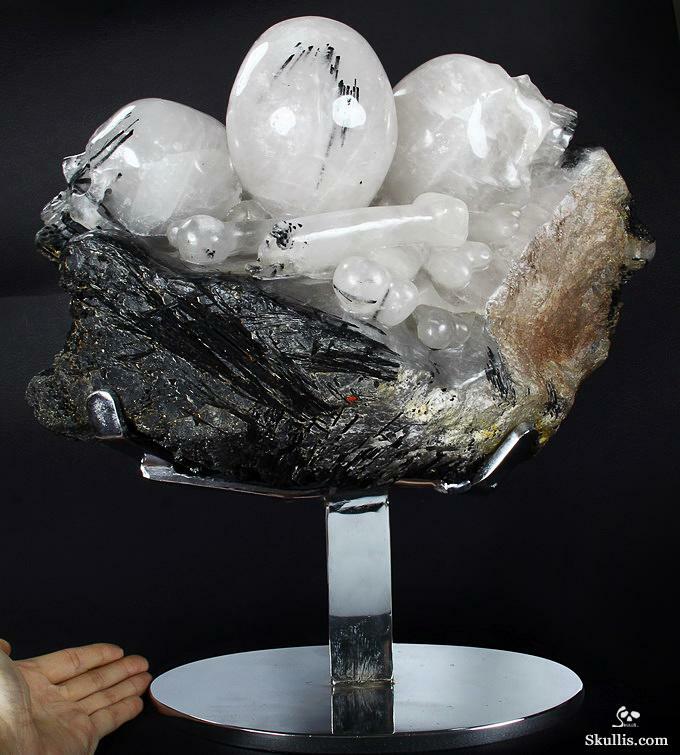 Three meticulously detailed black tourmaline included quartz crystal skulls and a pile of quartz bones are supported by an astounding array of black tourmaline crystals in this incredible marriage of natural beauty and artistic expression that is the Consciousness Expanding sculpture. 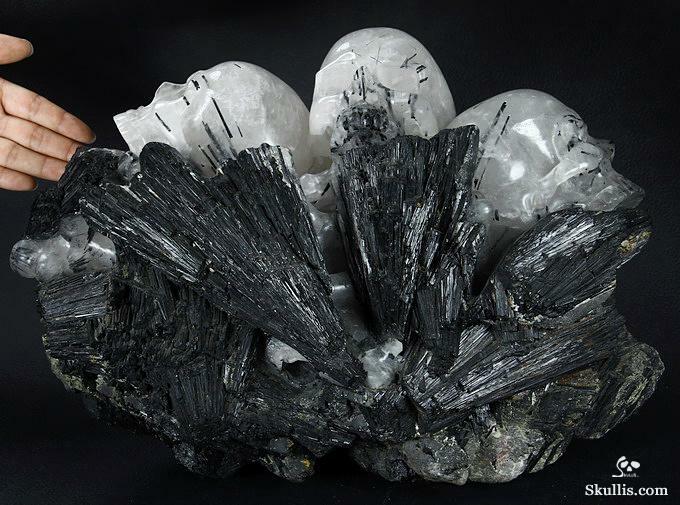 This fine black tourmaline and quartz crystal specimen comes from Guangxi, China, measuring 14.6 x 10.2 x 9.3 inches (370x260x235 mm). A custom designed stand which raises the Consciousness Expanding sculpture for display measures 10.4 x 6.6 x 8.0 inches (265x167x204 mm). 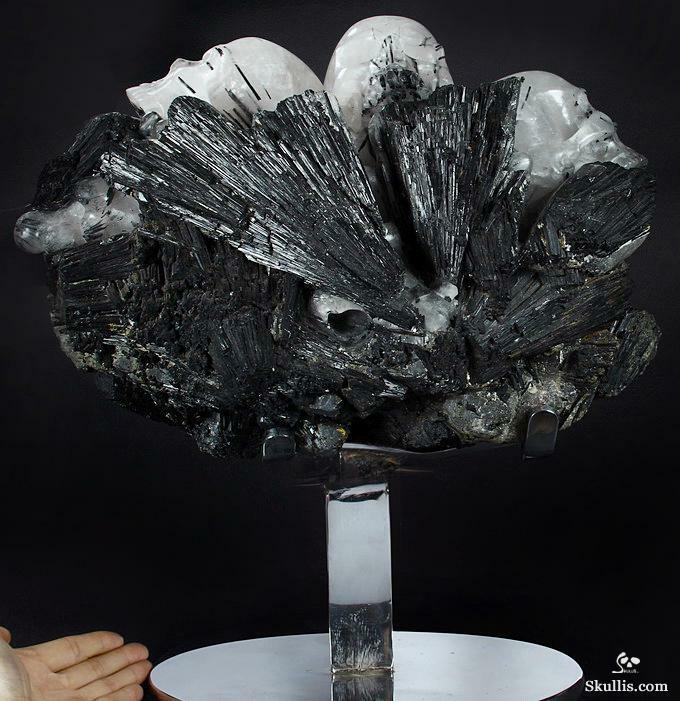 The total weight of the Consciousness Expanding black tourmaline and quartz carved crystal skulls sculpture is an impressive 58.05 pounds (26330 g). 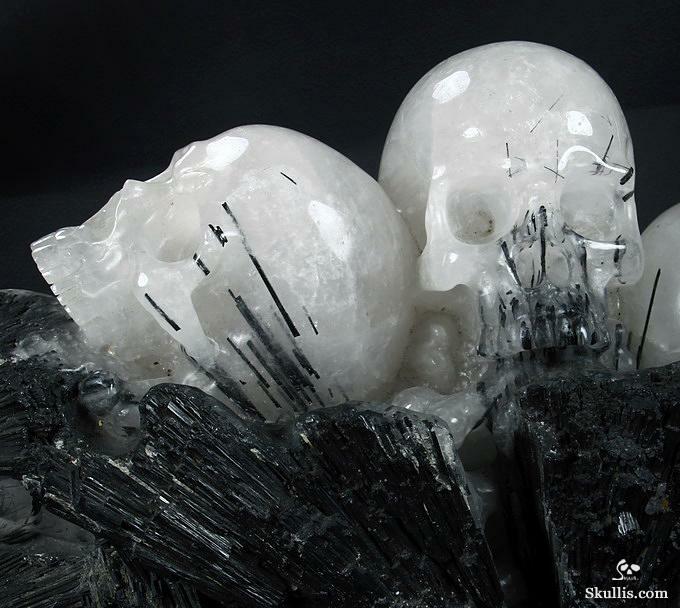 The Consciousness Expanding crystal skulls radiates an energy which promotes positivity and community while actively working to disperse and protect from negative thoughts, feelings, beliefs, attitudes, and behaviors. We are encouraged to express more often our kindness and nurturing qualities when interacting with other people, following the guidance we receive through our observations and intuition. 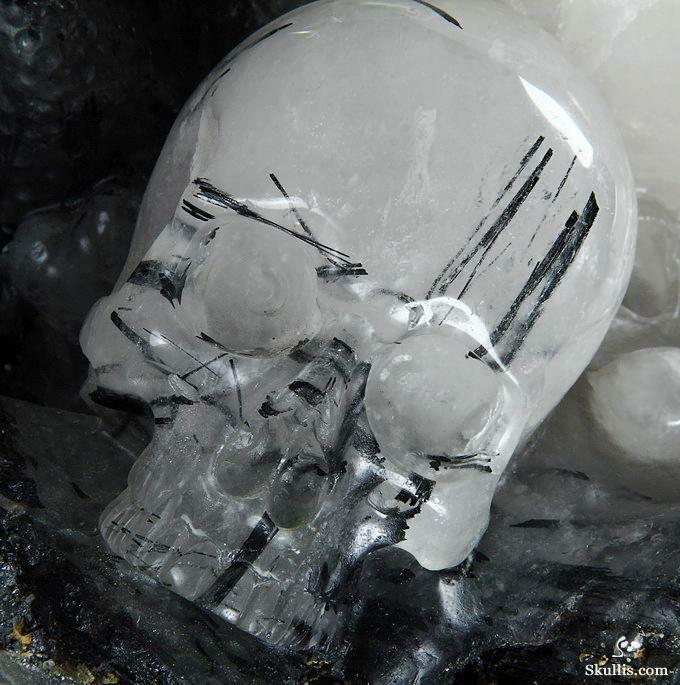 The Consciousness Expanding crystal skulls also help us to be more aware of when we are being excessively critical, and encourage us to alter our perspectives and release our tendencies to judge others and ourselves. The Consciousness Expanding crystal skulls teach us that if we truly can understand what another person is experiencing, we will also gain understanding of their behavior, and with this new understanding we are better equipped to offer our support and acceptance rather than our judgment. As we endeavor to help others, the Consciousness Expanding crystal skulls encourage us to remember to pay attention to our own needs as well. While we may be quite willing to help others find their happiness, we must also avoid neglecting the efforts that will bring joy to us. By ensuring we are happy and at peace, we are better able to help others achieve these in their lives. For those who are paying attention, everywhere we look we see mention of a coming ascension of humanity's consciousness. 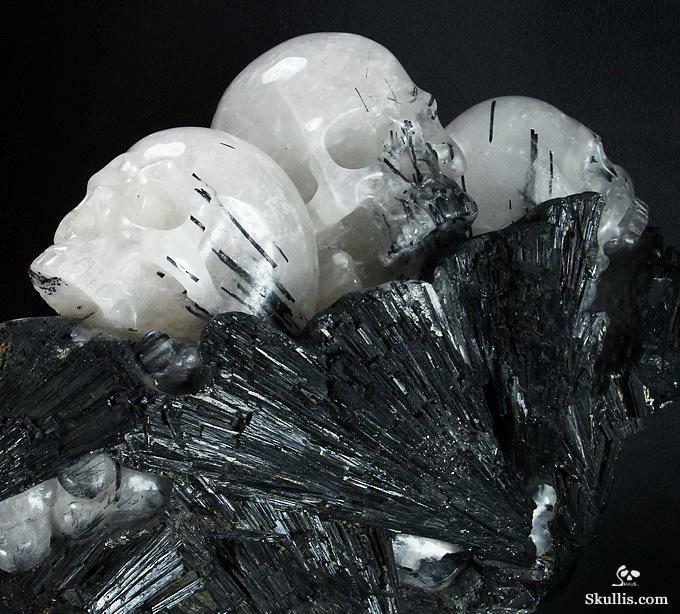 The Consciousness Expanding crystal skulls helps us to connect with our past, present, and future, and also helps us to be receptive to information regarding our past and future incarnations. Consciousness Expanding encourages each of us to be aware of the changes that we have experienced, and what changes we desire to see in our future, helping us to ensure our growth toward enlightenment and becoming individuals fully oriented in love. 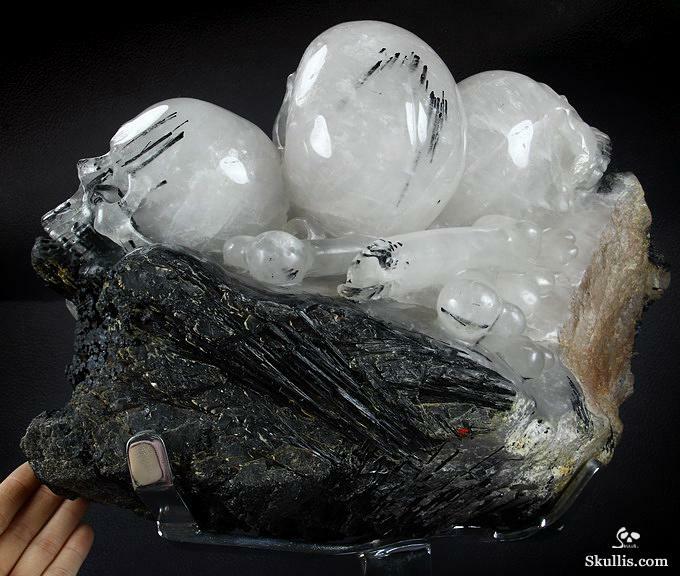 The Consciousness Expanding black tourmaline and quartz crystal skulls sculpture helps us to see the amazing possibilities we can, by the choices we make, bring into our reality. 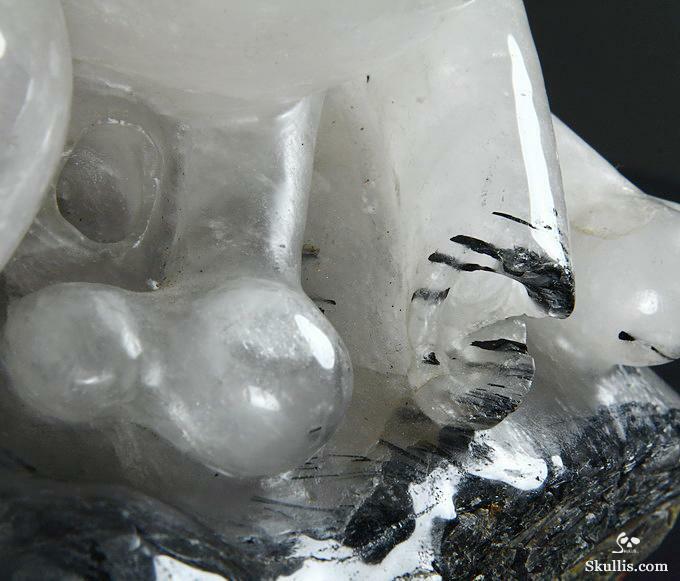 Quartz is considered to be a source of Light, and has been named the Perfect Jewel. Referred to by some as the “supreme gift of Mother Earth,” it is considered a master healer. Almost every culture throughout history has believed quartz to be a sacred and magical source of power. Aboriginal tribes of Australia and South America share their creation myth of the cosmic serpent being led and guided by a quartz crystal. 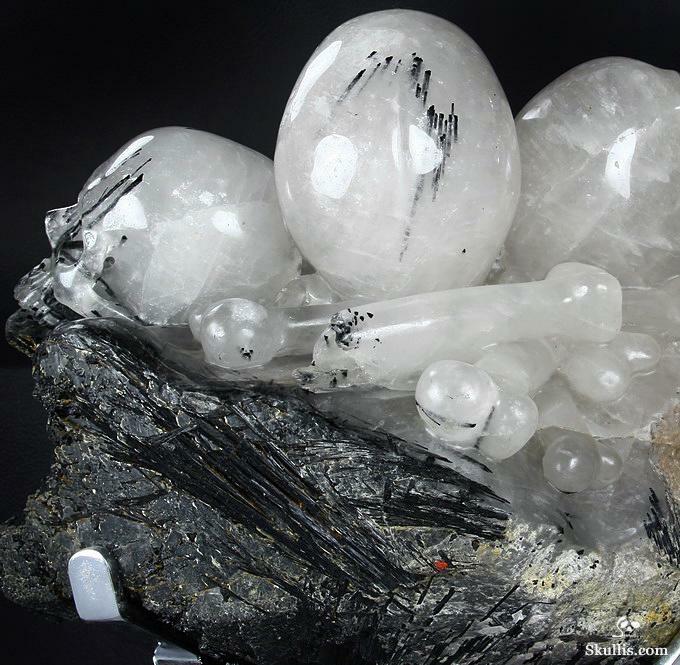 Indigenous people of North America and Burma believed quartz crystals to be living entities and ritually offered them gifts of food, some believing the crystal had great power to aid in divining and hunting. 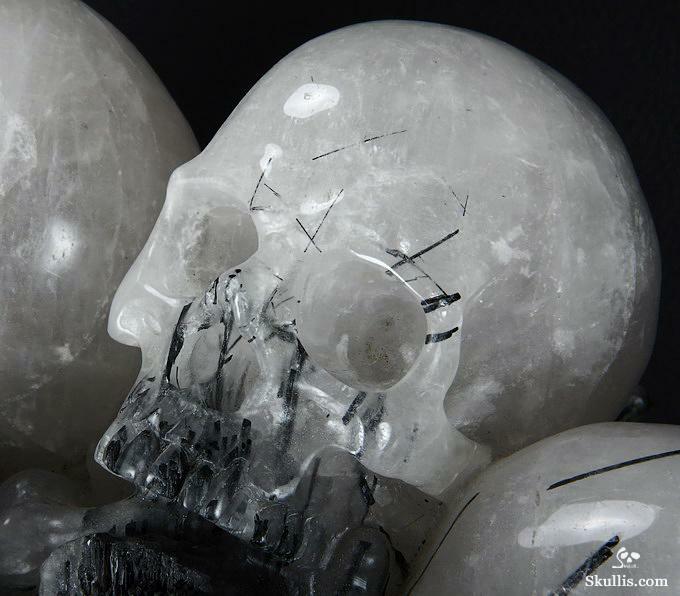 Central and South American cultures revered quartz crystals carved into the shapes of human skulls as powerful religious objects where deceased ancestors and gods resided. 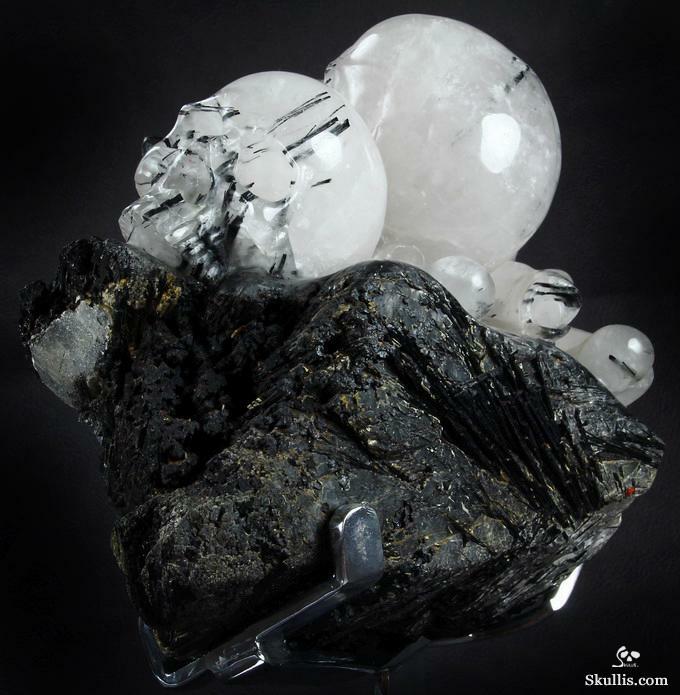 Quartz is considered to have been a key element in both the rise and fall of the cultures of Atlantis and Lemuria. It has been used by almost every culture for many purposes, including divination, bringing rain, enhancing magical powers, lighting sacrificial fires, as status symbol of high rank and royalty, and for prevention and treatment of dis-ease. Even in the modern world quartz continues to occupy integral roles of our everyday lives, including the device you are using now. And it was with a quartz crystal that Sir Isaac Newton discovered the color spectrum of visible light, created as the crystal refracted sunlight shining through it. 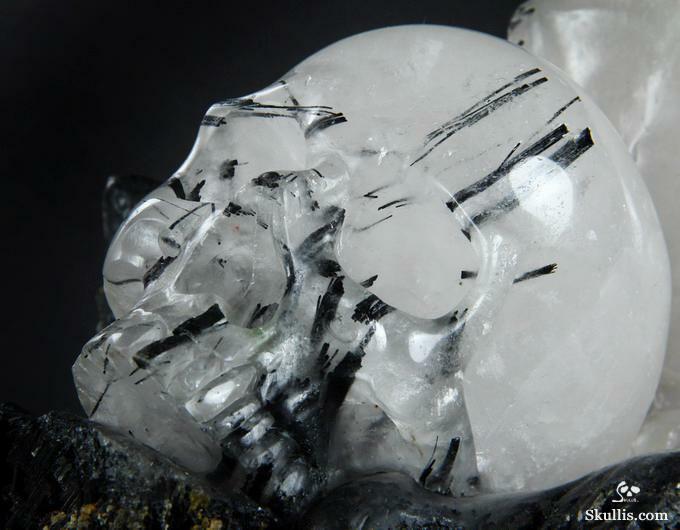 Quartz symbolizes sacred fire, purity, and the infinity of space, patience, and perseverance. Quartz instills harmony and purpose. 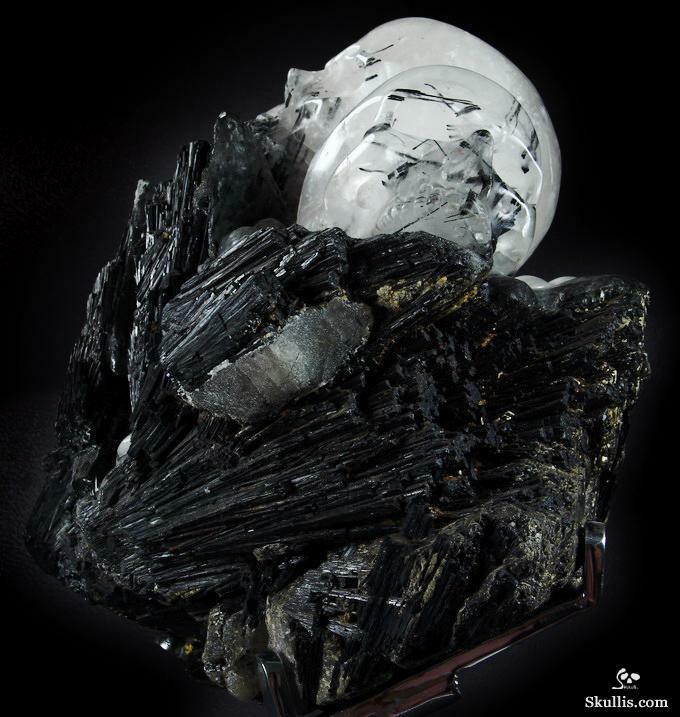 As it does with the technologies it is used in, quartz amplifies energy, accepts programming, and holds memory, making it the most diversely useful stone for healing, meditation, expanding consciousness, spiritual communication, past and future life recall, and any other desired application. Quartz exemplifies the concept of the saying “With God, all things are possible,” in the sense that when one comes from a position of unconditional love and acts according to the highest good of all involved, one can achieve any desired outcome. 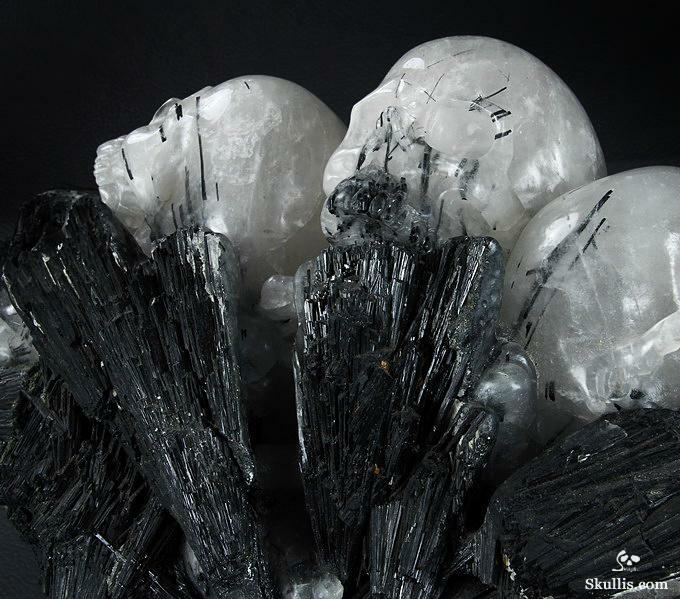 Quartz excels at harmonizing and increasing the energies of other stones, and working to fuse the energies of multiple sources into a cohesive focus, making it ideal for wands, staffs, gridding, and the like. Quartz enhances and disperses light energies in all directions, filling an environment with positive energies that remove negativity, protect the aura, and cancel the harmful effects of radiation and radioactivity. Ancient priests used clear quartz to nullify negative energy, dissolve enchantments and spells, and abolish all black magic. Emotionally quartz enhances the body’s internal structure and surrounding subtle bodies to further connect the physical body with the mind. 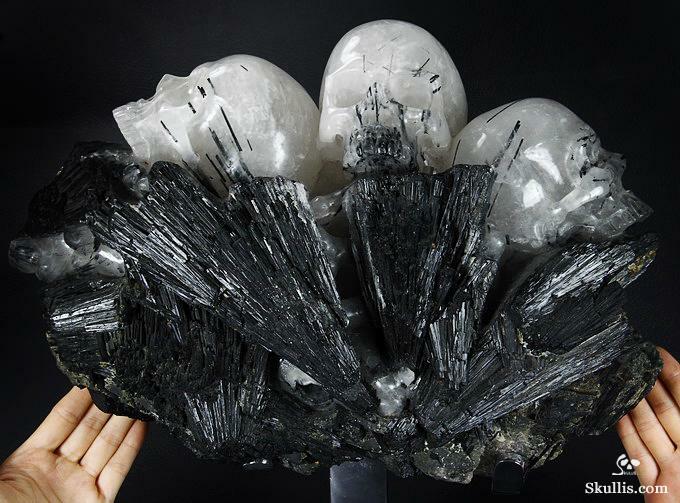 Quartz replaces any negativity found within with positive thoughts and feelings. Quartz enhances one’s perceptions of the world, increasing consciousness and clear thinking, and gives enhanced energy, dedication, endurance, composure, and patience, bringing the lesson of being loving and finding joy in peaceful coexistence. Clear quartz brings strength and clarity to the mind, boosting concentration and memory while filtering distractions. It is helpful in finding sleep, and helps with the interpretation of messages and lessons experienced in one’s dreams. 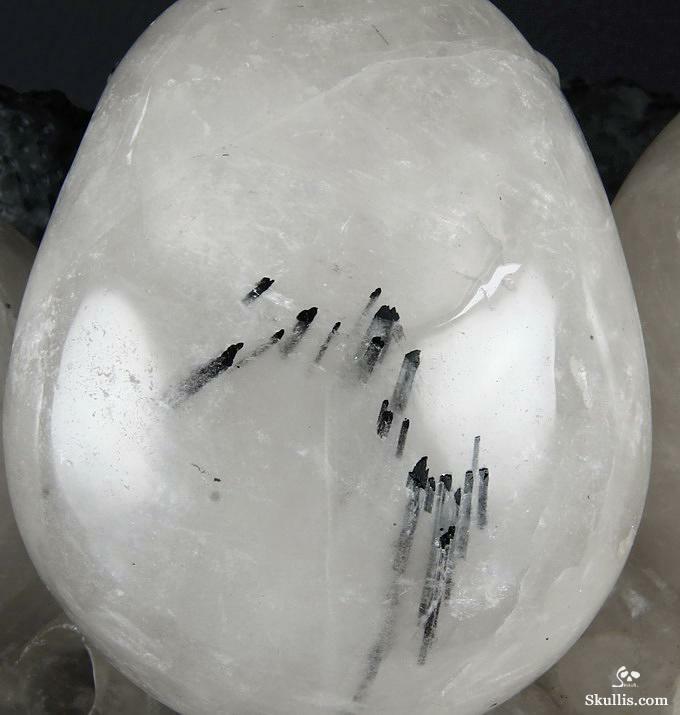 Physically quartz is a master healer and can be used for any condition. It is considered to stimulate the circulatory and immune systems, bringing vitalizing energy and balance to the body. 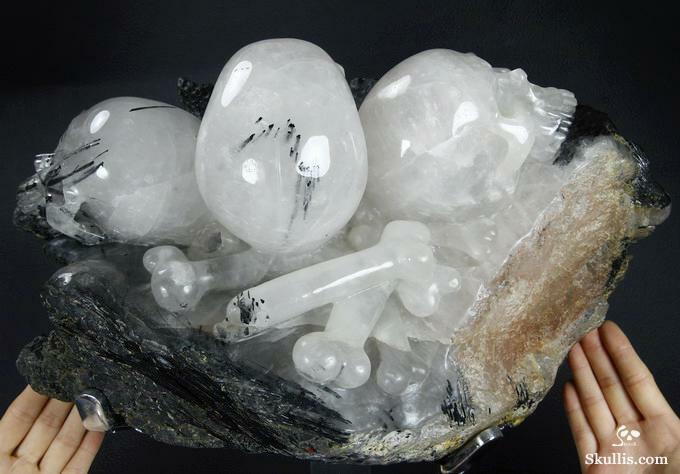 Quartz has also been used specifically to treat bladder and kidney infections and dysfunctions, and digestive disorders. It has been used to treat and remove the pain and effects of burns of the skin, and is generally effective for any skin disorder. Drunk as an elixir, quartz helps to remove toxins in the body. It can be used to overcome vertigo, and to dispel dizziness and improve balance. The energy of tourmaline naturally cleanses, activates, and enhances the chakras and the energy centers of the physical body, as well as one's mental and emotional aspects. 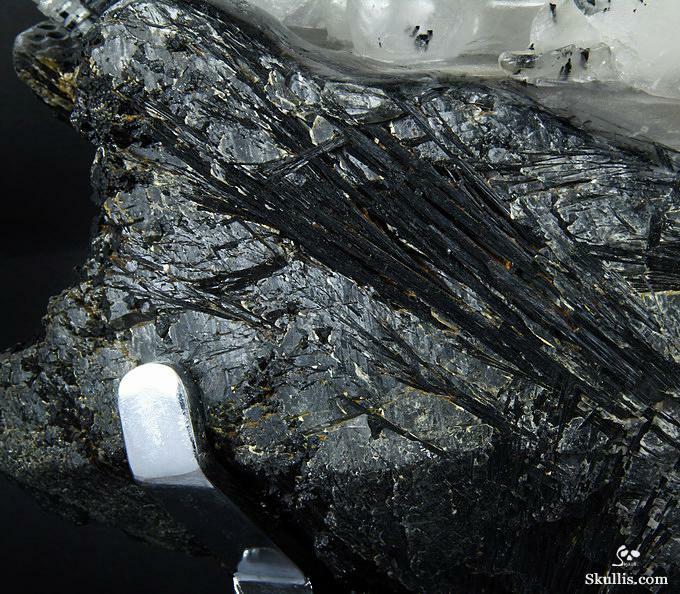 Tourmaline facilitates insight and new ideas, and bolsters one's confidence in oneself. By enhancing comprehension of situations and issues where one may be ignorant, tourmaline helps one to diminish and release fears that may be inhibiting progress and personal expression. Tourmaline brings equilibrium to the yin and yang energies, and also brings the aura, the mind, and the emotions into balance, aligning them with each other and with one's spiritual nature. Throughout history various cultures have used tourmaline as a crystal of discernment to determine the actions required to achieve optimal results for situations. It has also been used to reveal the persons and issues which are responsible for the experiences of difficulties and disharmony. Aboriginal, African, and American Indian shamans utilized tourmaline for protection from all types of physical dangers, and for healing purposes. African shamans have also used it to dispel illusions and as a means of understanding and perceiving the aspect of an individual that is the part of the universal whole. Tourmaline enables one to examine one's inner self with the understanding that what one experiences within is just as real as one's external experiences. It inspires perseverance and the will to endure, encouraging one to not only meet adversity with peaceful non-resistance, but to also maintain a positive and cheerful attitude, and assists one to surrender one's tendencies to feel persecuted, exploited, and victimized. Tourmaline brings balance to the right and left hemispheres of the brain and acts to harmonize and intensify energies and actions directed toward healing and manifestation. 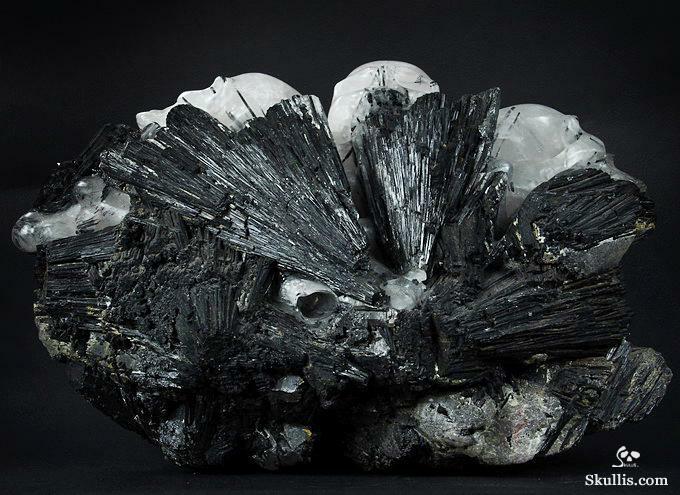 Black tourmaline is extremely effective for negating, shielding, and fending off negative energies of all types, including protecting from energetic attacks from others. 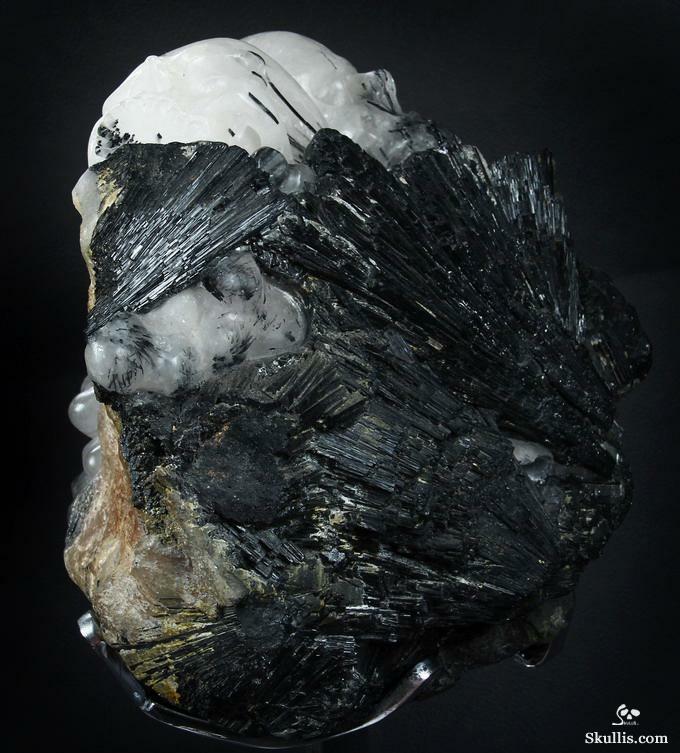 It has been used to provide protection from spells of malevolent intent, and, in combination with mica, to view the sender while returning the spell to its origin, and with quartz to dissipate the spell while vitalizing the intended victim to increase their health and welfare. It can be used to protect one from radiation, and to enhance one's physical endurance and stamina, emotional balance, and mental functioning. It is also effective in helping one to keep a positive attitude even during difficult and trying situations. 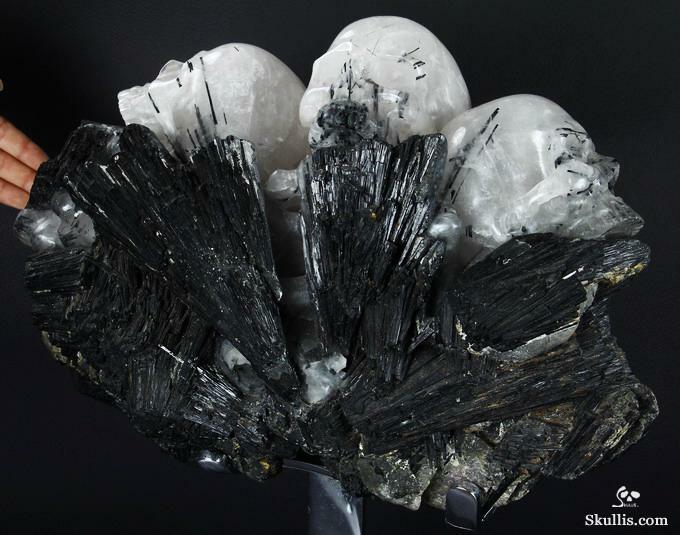 Black tourmaline inspires selflessness, and also sensibility during creative processes. 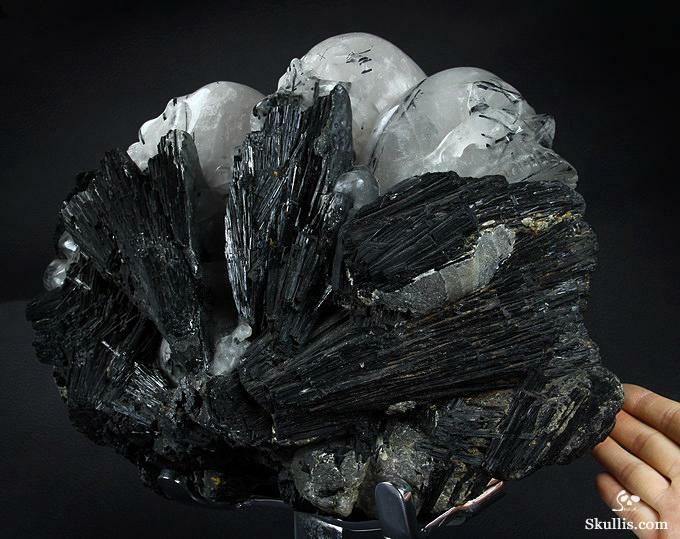 Black tourmaline also provides grounding, connecting one to the center of the Earth, increasing all aspects of one's good fortune and health in the physical reality, while protecting from spiritual and physical beings that are not oriented in light, harmony, and love. 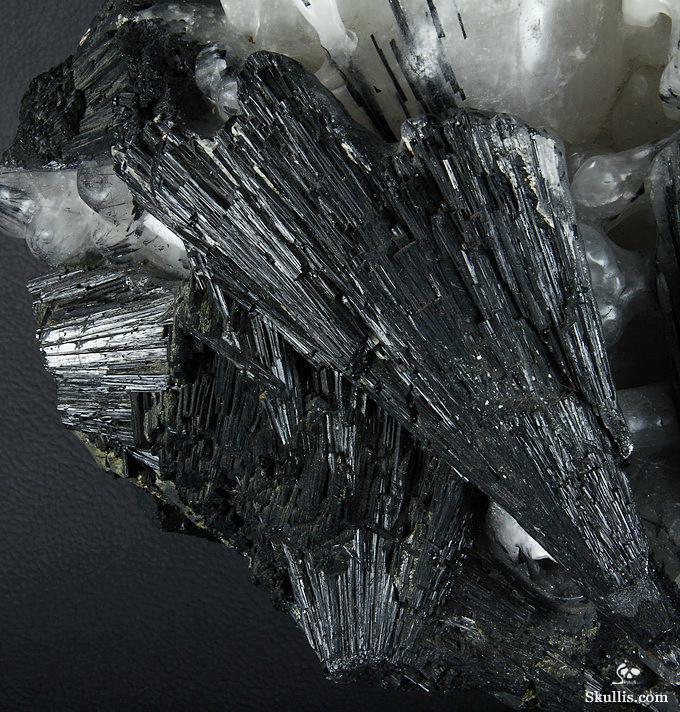 Black tourmaline vitalizes the reflex points related to the lower back, and has been used to activate and balance the adrenal glands, as well as to treat confusion, heart dis-ease, arthritis, and dyslexia. NOTE: Skullis does not prescribe treatment for medical issues. 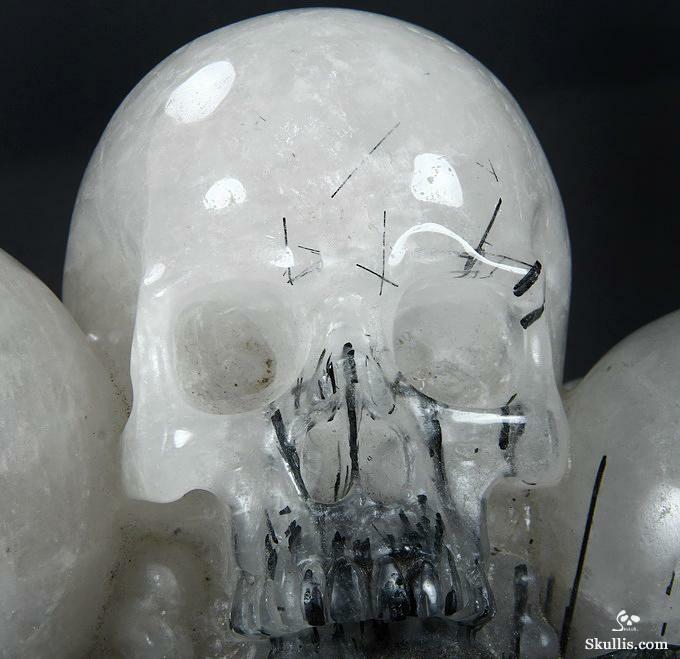 Skullis offers information for reference to assist with the selection and understanding of crystal skulls, including this tourmaline and quartz crystal skulls sculpture.